Forays of a Finance Foodie: Orale: Hip Mexican On The Upper West Side That Doesn't Disappoint! 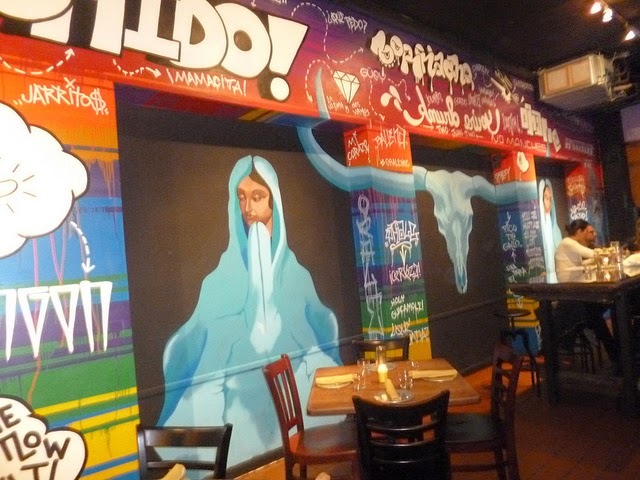 Orale: Hip Mexican On The Upper West Side That Doesn't Disappoint! The Upper West Side's Orale is a place that is as appetizing on the eyes as on the palate. There is a fun atmosphere--barrio style florescent graffiti lines the front walls and the dead center features 100 of bottles of Jarrito's soda against a lit wall (creating some very unique "pop art”). There is also some interesting Day Of The Dead art placed in key spaces in both the bar and dining area. The staff is friendly in this month-old eatery and will customize the food without charging you extra and with no hassles. My dining partner Gail and I started out with guacamole done three ways (the menu offers at least five different versions of guac); you get all three for $12. The Orale guacamole is all made with the same traditional recipe but the toppings make all the offerings different. Our favorite was the blue cheese and pepitas topped guacamole known as the Blue Demon, but the Casa (guac made with onions and jalapenos) and El Naco (guac topped with crispy braised pork belly) really had a nice kick to them in different ways. Next, we shared a side of Rice And Beans (they do not come automatically with the entrees) and they were as good as it gets at only $6. Nothing tastes like Mexican black beans and rice made from scratch, especially when divine orange Mexican rice is used. 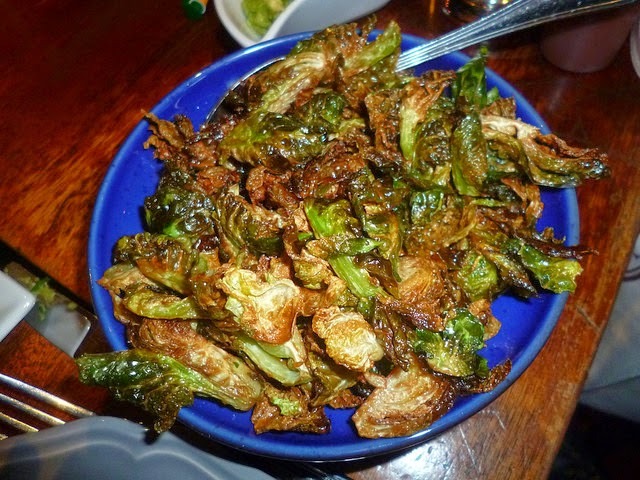 We also got the Brussels Sprouts which were lightly fried in vegetable oil, simply seasoned with salt and pepper and tasted like they were just fresh-picked on a local farm. (I am assuming that they actually were.) It was a large portion—about 1 1/2 cups--for only $5. 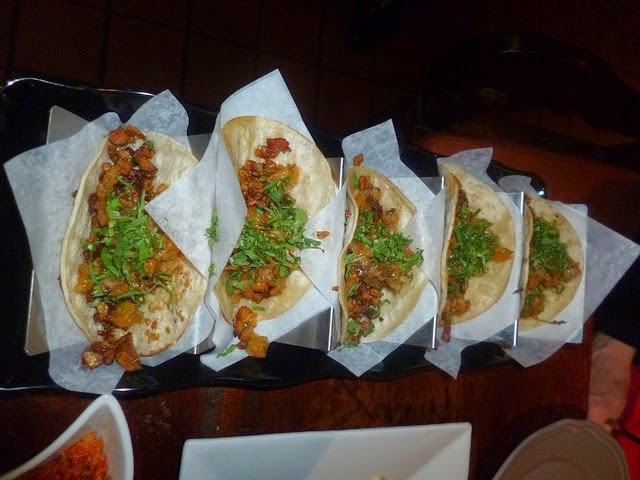 We then shared the very soft and warm white pork tacos called Al Pastor ($26); it's a huge portion for just one person since consists of a tray of five medium tacos. The juicy and chunky pork is topped with caramelized pineapple, chile de arbol and cilantro. 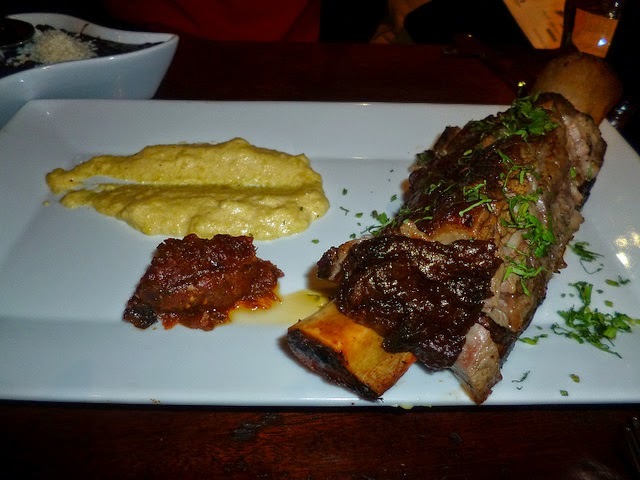 We then ordered the oddly named Dinosaurio, which is an anco and chipotle marinated extra large beef bone grilled with tamal de olla and a tomatillo chipotle compote ($25). The short rib was anything but "short" and was possibly the most tender that I've ever had. It's actually a super large prime rib bone and the meat literal fell off the bone (I used a spoon to serve it)! The meat is so juicy because it has a large amount of marbling. I very much recommend this to all and any beef bone maniacs--this is a truly sensational treat for those of us who can never get the waiter to bring us the bone when ordering prime rib out! 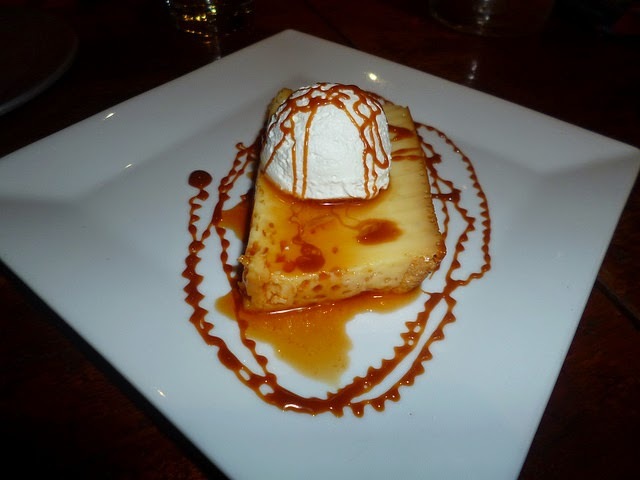 We ended with the divine and classic Mexican dessert, Vanilla Flan With Caramel Sauce ($7), which is served with a large dollar of homemade whipped cream on the side. The flan recipe is traditional and the homemade Mexican caramel is as thick and gooey as it comes. This is a dessert you can never go wrong with in a Mexican eatery, but especially at Orale. It’s the perfect “finishing touch” on a great meal. I will be definitely be heading back to Orale—I am dying to try the Carne Asade next time. Who can resist a beef tenderloin topped with red onion and chili lime fries? Not me, for sure!